We really just tagged a couple of days on at the end which did not do justice to Bolivia. Some great ruins, and cracking views of La Paz at night from the plateau. Will definitely go back and give it more time. We had planned a last night of the holiday meal and drink, but ended up being caught up in a riot and got tear-gassed. Getting back to the hotel through the police lines with the words 'turistos, turistos'. Don't try the metal detector, with a Swiss army knife in your ruck-sack! Fortunately when the x-ray machine man pressed the alarm button for help, no one turned up so after stabbing his terminal a few times he folded the knife up and handed it back to me and moved us on. Cocoa leaf tea-bags available in the departure lounge! 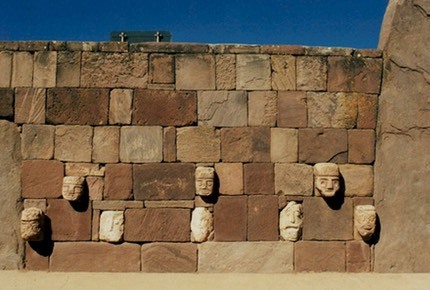 Inca ruins at Tiwanaku. This is an impressive site and will get even better as more is excavated. We saw real guinea-pigs in the grass here. At the moment as relics are discovered they are displayed in the most tourist-friendly manner rather than archeologically. Temple of heads, a square temple the size of a tennis court with carved heads set in the walls all the way around. The heads are interesting because they appear to show lots of different races of people, and one head that looks like a space-traveller, or it could just be good imagination. 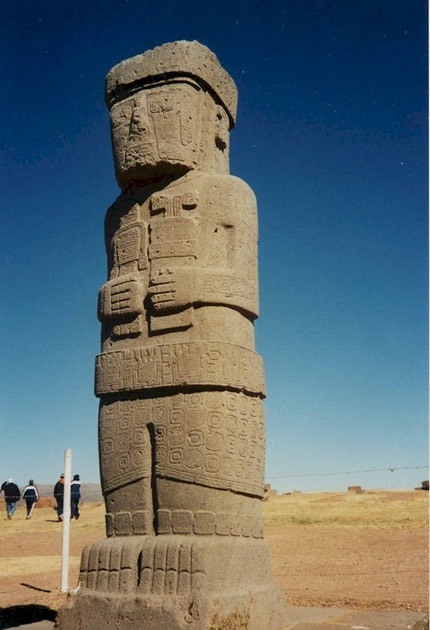 Our second trip to Bolivia started in the same way as the first in that we stayed in La Paz and visited Tiwanaku again. No further restorations had taken place although we were assured they were starting next week.... After leaving Rob and Helen in La Paz we moved on to Uyuni where we did the obligatory salt trip before heading through Potosi, Sucre and Cochabamba. 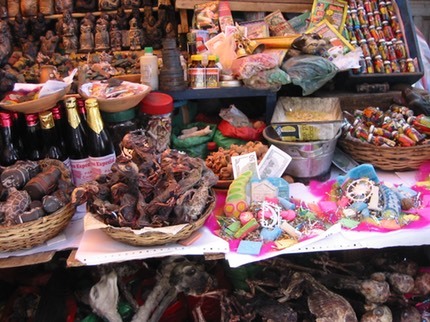 In La Paz there is a witches market where charms and sacrifices are sold including the dried foetuses of Llamas. I bought a lucky charm just in case, but it got stolen in Mexico, so hopefully someone is having a very bad life at the moment. 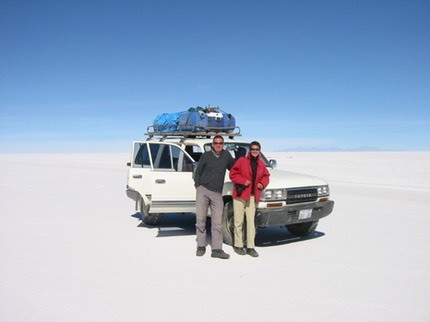 High on any travellers list is the 4 day tour of the salt flats around Uyuni, a truly stunning thing to do. It's freezing cold and the sheer expanse of salt is staggering. We saw 3 different types of flamingos surviving up here, and a great island covered in tall cacti. I had been seriously ill on the salt flat trip so needed some recovery time in Potosi. 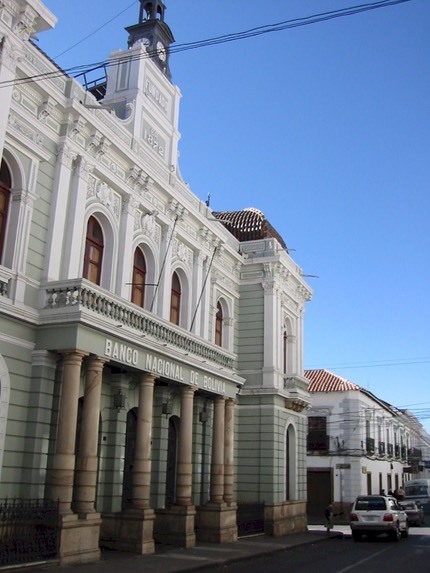 There are many nice colonial towns here with good examples of Spanish architecture including this bank. We suffered a major disappointment in Sucre having lost track of the days. It was Sunday so the promised dinosaur footprint quarry was closed. We ended up in Cochabamba from where we were due to catch a flight to Paraguay.Something odd happened here when we decided to buy some wine. The only place we could find, was some kind of wholesaler, which let me buy two bottles, but first insisted I filled in forms as if i was a wine importer from Europe. Still, it tasted good.